Strangers and stranger … Here’s another to recently arrive. Huge “reservoir” of water (three times the volume of all the Earth’s oceans) discovered deep beneath the surface of our planet. People will not be able to take advantage of this resource, as this water is in aggregate state, but this finding could further help explain how the planet formed the seas we know today. The water, as has been said, is not in liquid state and neither is it in the form of ice or steam. It lies held within the mineral ringwoodite , Which is stored at A depth of 700 km in the Earth’s mantle – the layer between the hot rocks of the Earth’s surface and its core. Ringwoodite and wadsleyite has A remarkable special ability to absorb water like A sponge and is A rare type of mineral that is formed from the more well-known olivine at very high temperatures and pressures, such as those that characterize the deep layers of the mantle. Laboratory investigations showed that the mineral water may be trapped in the molecular structure of ringwoodite in the form of hydroxide ions. There is something very special about the crystalline structure of ringwoodite. Scientists have long suspected that the so-called mantle transition zone, which lies between the layers of the upper and lower mantle at depths of 410-660 kilometers from the Earth’s surface, may contain water, enclosed in rare (to us) mineral. This new find sheds light on the origin of water on Earth. Some geologists believed that water was brought by comets that collided with our planet. However, this discovery has helped to push the alternative hypothesis: the oceans gradually leaked out from the inside of the early Earth. This explains why water is circulated from the surface to groundwater and vice versa. 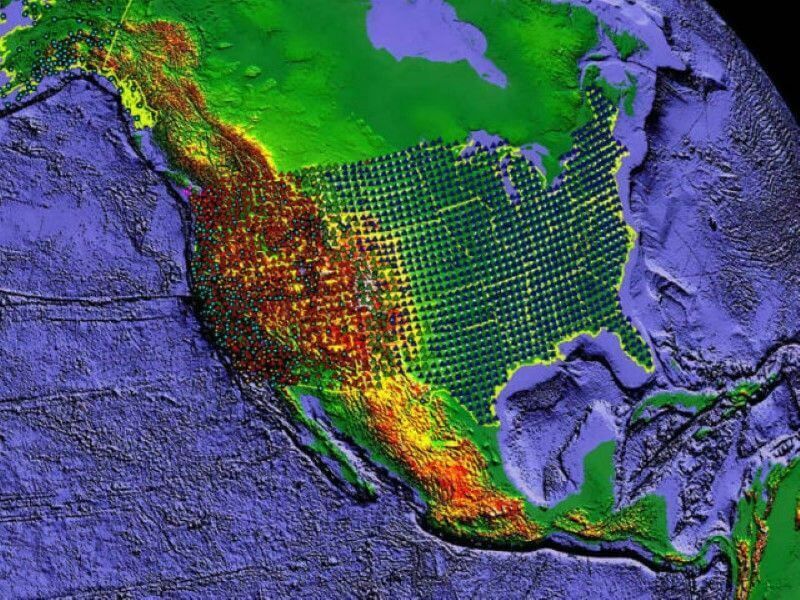 Team Jacobsen 2000 seismometers used throughout North America who have studied the seismic waves generated by more than 500 earthquakes.These waves travel to the “inner” core of the earth. Once these waves bounce back from the Earth’s core they can be detected at its surface. In Fact, they’ve ringed the Earth with these sensors – it’s like a vibration dome bell. Measuring the velocity of the waves at different depths, the team was able to find out what types of rocks these waves traveled through. Rocks saturated with water have been discovered due to the fact that wave passes through them Far slower than through the “dry” material. To simulate the pressures found beneath our feet, scientists used a ‘diamond anvil’. Between the tips (5 mm in diameter) is a piece of mineral undergoes changes typical of those that occur in the mantle of the planet. Through this, Jacobsen calculated in advance what will happen with the waves, if on their way to meet the water-containing Ringwood at a depth of 700 Kilometers. So the researchers were able to detect signs of ringwoodite in the transition between the upper zone and lower portion of the mantle. Interestingly, the current studies so far only tell Jacobsen about the rocks under the US territory. In the future, A scientist would like to understand whether this vast reservoir of water exists under the entire planet.